Please find below an extract from a recent interview given in relation to FA Racing. 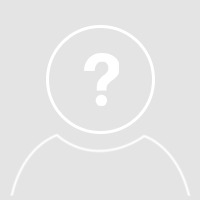 Interview: Most will know and understand your ability football betting, particular with the website name being FootballAdvisor.net, yet might not be aware of your interest and prowess when it comes to horse racing. Can you outline your background in racing and why you are offering the Racing Bet Profits service? Jon: Although my passion has always been and always will be football and football betting, I cut m... morePlease find below an extract from a recent interview given in relation to FA Racing. Jon: Although my passion has always been and always will be football and football betting, I cut my teeth in sports investments through horse racing originally. Being analytically minded it was the natural starting point for me as there was just so much data available at the time, unlike in Football, (Which is a large part of the reason I created the website Predictology, but that is probably a story for another time). I simply enjoyed spending hours and hours in excel sheets testing ideas and models - although I realise this not everybody&apos;s cup of tea. Somewhere around the mid 2,000&apos;s there was a tipping point where my knowledge or racing, horse racing betting and my analytical skills from my day job at the time reached a point where I started to experience some real success. Many of the members probably won&apos;t know this but for a number of years I ran a popular racing website called SystemLays.co.uk. To focus on football betting, I sold that website on four or five years ago now, and sadly it is no longer in existence. However, a number of people followed me across from System Lays to Football Advisor and I would get requests frequently to start sharing some of my racing models again. 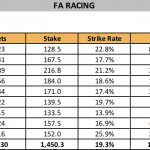 Early last year I finally relented and FA Racing was born and we have experienced a phenomenal first year with some handsome profits with the service continues going from strength to strength. Then about six months ago as were in the process of preparing the launch of Football Lay Profits, Pete and I got to talking about what I was doing with the horse racing and whether there was something in it that we could bring to the SBC community. We were both keen to do this and I happened to mention that the FA Racing service contained two different models and one model was much stronger than the other. By segmenting this more profitable model off and by making a couple more enhancements, we felt this would give SBC members the best opportunity to access the selections....and thus Racing Bet Profits was born! Interview: When are the tips advised and which bookmakers do you quote? Jon: Selections are provided at 8am each day and we take the Bet365 price as the advised price. We record all of our results at SP, BSP and BOG so depending on members betting restrictions, or not, they can see the profit potential for their personal circumstances. Interview: How do the odds stand up or move? Jon: Due to the policy of only quoting the odds offered with one bookmaker, Bet365 at 8am, we have found it relatively easy to get on at comparable prices within the first 30 minutes of the bets being advised, with further shifts especially after 10.30am. To gauge the odds movement exactly, we have been monitoring the advised prices for several months now and looking at how the odds change after 15 minutes have elapsed and also at 8:30am and at 10:30am. Therefore, our recommendation for FA Racing members is to place the bets by 8.30am to get as good a price as you possibly can. Even at 10.30am, whilst there is some movement, overall this indicates an overall ROI drop of approx 4 to 5% if taking those prices. How about losing runs and drawdowns - what are we looking at and what kind of strike-rate are you hitting? We use a complex model to generate our selections, which uses a five point rating system adding different scores and weights to the five key form attributes that we deem the most important: Distance, Course, Field, Going and Class. This allows us to weight and price runners in a race and identify any potential value. The final check is to look at &apos;what could beat&apos; our selection. If we are satisfied that our selection is the clear marker it becomes a selection that we share with members. At these kinds of odds we have to expect losing runs and proper betting bank management is imperative. Our largest drawdown to date has been 48.36 units. Although we hit a new profit high as recently as last week. Do you have any advice on the betting bank requirement? Although the previous largest drawdown is 48 units, I always prefer to recommend caution, which is why we recommend betting bank sizes ranging from 120 to 180 points depending on your risk profile. For those of you wishing to be a bit riskier, than 120 points seems sensible, whilst those of you cautious can opt for 175 points. For official figures we will be sitting between the two at 150 points. Our betting bank suggestions are based on a couple of key elements: The strike-rate (20%) and average stake (about 1.19 points per bet).